In the seventh book of her Life in the Icicle Falls series, Sheila Roberts gives readers a holiday story that reads like the script for a Hallmark movie. Olivia Wallace, owner of Icicle Creek Lodge, is preparing for a full house to join in the lodge’s annual holiday festivities. Even as she rejoices in the success of her business, however, she still misses her husband. Fourteen years of widowhood have not erased her memories or her wish that he could see the lodge they planned together flourishing. But if she’s suffering from a touch of holiday blues, none of her guests will ever suspect. Neither will her sons—Eric, her right hand in managing the lodge and the wandering Brandon, who is coming home for Christmas. James Clausen has been playing Santa Claus for years, but this year he feels more like Ebenezer Scrooge than jolly old St. Nick. His wife died last Christmas Eve, and his grief has him dreading the seasonal celebration. He’s not thrilled when his daughter, Brooke, books rooms at Icicle Creek Lodge for the two of them and her brother, Dylan, because she thinks doing Christmas differently will be easier emotionally. But James doesn’t want his kids to know how depressed he is, and when he meets Olivia, who not only understands his feelings but also shares his fondness for peppermint schnapps in her hot chocolate, the season begins to look brighter. Single mom Missy Monroe has been saving for a year to bring her two children, Carlos and Lalla, to Icicle Creek Lodge. A hairdresser’s salary doesn’t allow her to give her kids everything she wants for them. She can’t fill their requests to Santa (a puppy for Carlos and a grandma for Lalla), but she can give them a Christmas with all the trimmings, one they will always remember. Missy has no premonition that this Christmas in Icicle Falls will change all of their lives forever. John Truman is a true romantic, and he thinks Christmas Eve at Icicle Creek Lodge will be the perfect setting to propose to his girlfriend Holland. If Holland is less enthusiastic than he is about the holiday he has planned, he’s convinced that it’s just because she is less romantic. Surely the combination of Christmas and an engagement ring will make her as happy as he is. Or will it? All these visitors journey to Icicle Falls in search of a special Christmas. In this idyllic winter setting, the Wallaces and their guests will find more than they sought. The gifts Christmas brings will make not only the holidays a magic time but will also add a luster to their ever afters. If you like your Christmas romances sweet and sentimental, add this one to your TBR list. Cynics beware: this book is not for you. It is filled with all the traditional Christmas touches plus Roberts’s trademark humor and multiple HEAs for a group of likeable, ordinary people whose lives entwine in various ways when they share a holiday in Icicle Falls. 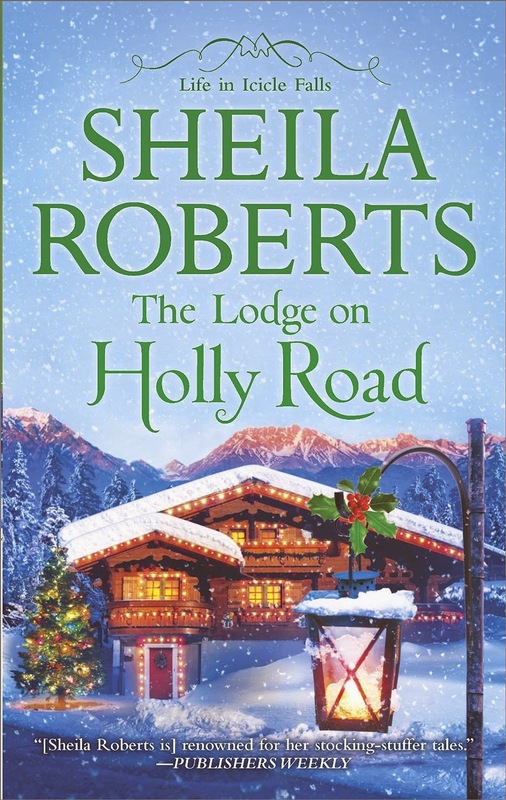 Although it is part of an established series and familiar places and characters get a nod or two, The Lodge on Holly Road can easily be read as a standalone. This is on my list to get. I LOVE reading sweet Christmas stories. This novel sounds really good. I have already started reading this year's Christmas books and they are all so good. Doesn't this beautiful cover make you want to grab a big breath of those glorious air? PJ, thanks so much for bringing this book to our attention. I love holiday books and this sounds like one I need to add to my collection. The holidays are a magical time, giving an air of hope, happiness, camaraderie, joy, and love to lives. It is a time for everyone to hope for something special and if they are lucky, find it. "Sweet and sentimental" is perfect for this type of book. I tried to post yesterday it wouldn't go thru..got this book in the mail yesterday will get to it soon thanks for the review. I guess I am not the only one who has had posts not show up. Thanks for sharing your review of this book.